Casting of the resin parts is very good. Parts had little to no flash and only very minor filling to be done on the back of the turret. The brass barrel is from Schatton and is of excellent quality. It was great to see the addition of this part for the kit, and I wish more models just came with the brass/aluminum barrels to begin with! 10 parts total: 9 resin (new turret, 2x recoilless rifle tubes, 2x turret side/gun shields, 4x new return roller mounts) and 1 brass barrel. Some history on the Panzer IV project, data on how to mount the new 3 stations per side return rollers and suggestions for late war color schemes. The base kit used was a Revell Panzer IV Ausf.H. Blister pack, resin parts in small plastic zip-lock bag and brass barrel taped to cardboard for protection. 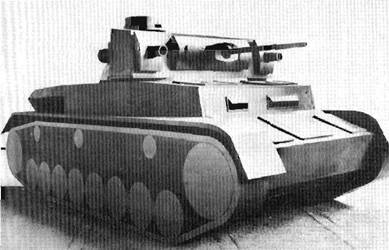 This project never made it off the drawing board, however, the recoilless rifles were in use by the Germans and the turret is a simplified Panzer IV turret, so the item could have been realized easy enough. You will notice that the side hatches are hinged reverse, so the loaders for the 7.5cm kanonen can have easy access and some ballistic protection. The 30mm gun was also in use by the Germans but in this configuration it had a dual purpose. One being a ‘ranging gun’ for the recoilless rifles, the other being for the panzer’s defense. 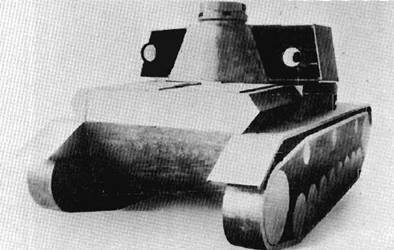 This panzer was designed solely as a block-house destroyer, not as another blitzkrieg weapon!